The Valor Fitness MB-H is a 2.5” Safety Bar Extension designed to give the user the added insurance while lifting Personal Best limits. Utilizing a straight, 11.75” rubber protected reinforced beam, this distance and support is designed to catch or support those reps that just could not quite make it back to the original starting position. Adjusting the Safety Bar Extensions are just a turn of the wrist. Rotate the Extension 90 degrees, pull from current location, find desired location, insert Bar Extension pin into frame, rotate back 90 degrees. Confirm you have the correct adjustment “before” you start your workout. 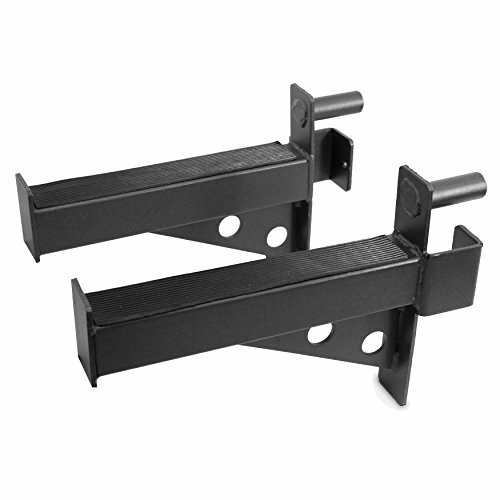 MB-H bar extensions are 2.5"x2.5" and will fit the Valor Fitness BD-11, BD-20 and BD-41 Power Racks. The Valor Fitness MB-F short bar holders are 2" x 2" and will only fit Valor Fitness BD-7 and BD-33 Power Racks. Please note that all Valor’s accessories are designed to fit Valor products . If you currently have your own equipment and will be outfitting with an accessory, the MB-H will fit most 2.5” frames with 1” peg holes. Please double check your measurements. Max weight limit is 750lbs and are sold in pairs.